Metro Handles allow for better maneuvering and fit both Super Erecta and Super Adjustable posts. Both extended and push handles can be used on stem caster carts and dolly frame carts. Metro handles are attached using Super Erecta Split Sleeves (9985) Extended Handle (EH) pictured. 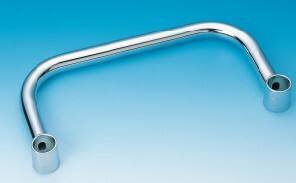 Handles improve maneuvering and ergonomics. Easy-grip (left), swing up, and extended handle options. Add extended handles to posts on your cart for better control when pushing product down a hall or around corners. Metro push handles are added for additional maneuverability to dolly carts or stem caster carts, split sleeves included for attaching to cart, available in push handle (PH) or extended handle (EH). Push handle pictured. Add extended handles to posts on your cart for better control when pushing product down a hall or around corners. Metro push handles are added for additional maneuverability to dolly carts or stem caster carts, split sleeves included for attaching to cart, available in push handle (PH) or extended handle (EH). Push handle pictured.